*Aircraft photos are credited to the respective photographers from Airliners.net. Welcome to my trip report on Far Eastern Air Transport! As some of you know this is not my first report on this airline but I decided to do especially with the airline phrasing out this aircraft next year. 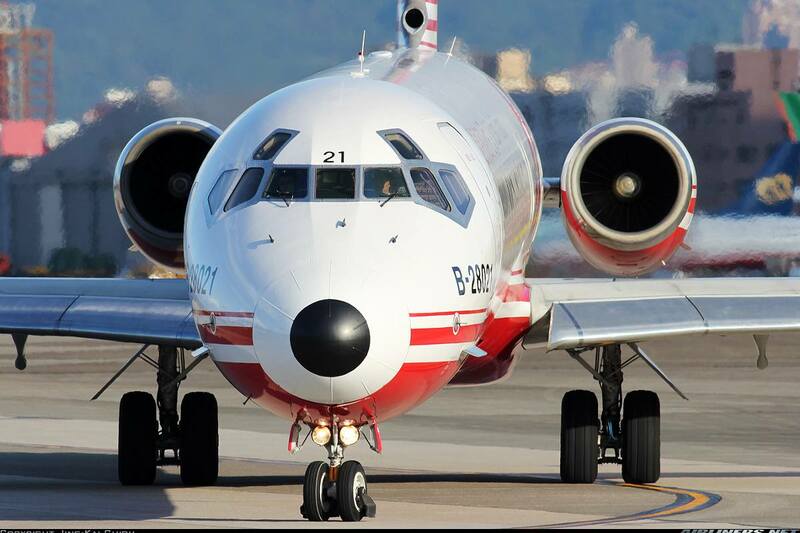 This aircraft has around one more year to go before it get scrapped, so why not fly a few more times on it, right? For my part 2, click here. 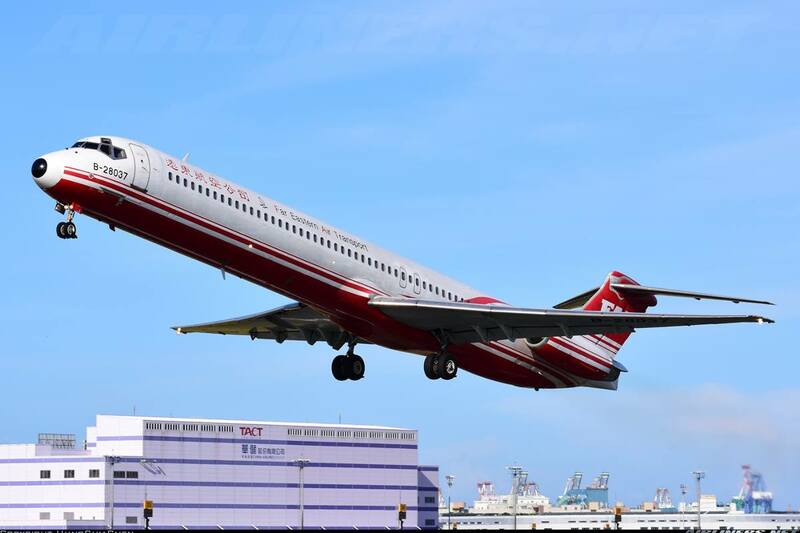 This report is dedicated to all McDonnell Douglas fans and the Taiwanese aviation enthusiasts! How did this trip come about? Flying on Far Eastern Air Transport (FAT) is an agenda even though I flew with this airline thrice. The reason is to catch the MD-80 series aircraft before its phrased out in Asia. Its still possible to catch one in Indonesia with AirFast carrier, but this airline operates mainly chartered flights and I am not very enthusiastic about flying on this airline as Indonesian carriers apart from Garuda, Citilink, Batik Air and Sriwijaya Air have dodgy safety record. So since these aircraft are still around, why not enjoy them before they are gone. Besides there are plans for this airline to replace them with Boeing 737-800. Once that was decided, it was time to do the booking. Once you click the search button (red button below the calender), you will be at Step 2 which shows you the choices of your desired flights. 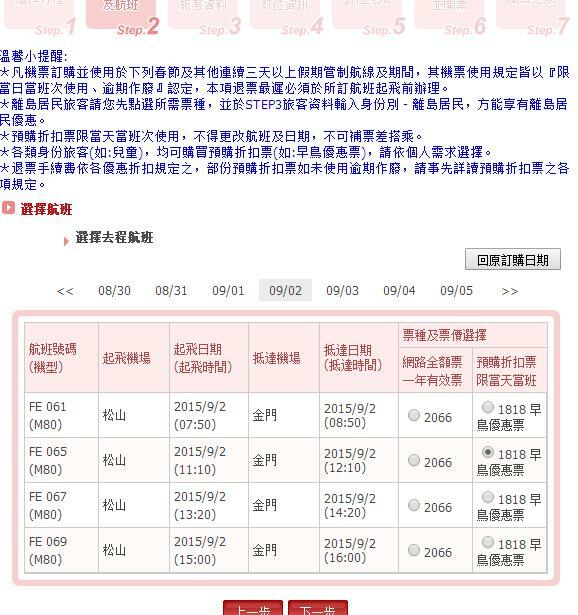 The price of 2066 (Taiwanese dollars) is normal fare while the 1818 fare is for early birds purchase, and anyone can book it. So depends on your luck; sometimes you get it, sometimes you don't. You see two red buttons below the flight details (Above), the left click-able icon is to return to the previous page, the right icon is to move on to the next page. Once your desired flights are chosen, click on 非會員登入 (Non-member). 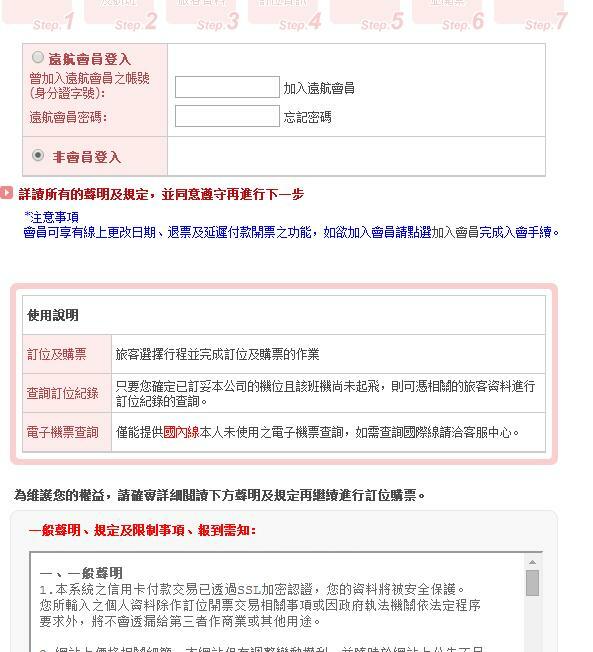 Once you are the page below, you have to fill up your details. Just key in 姓 - Drinkwater and 名 - George will do. 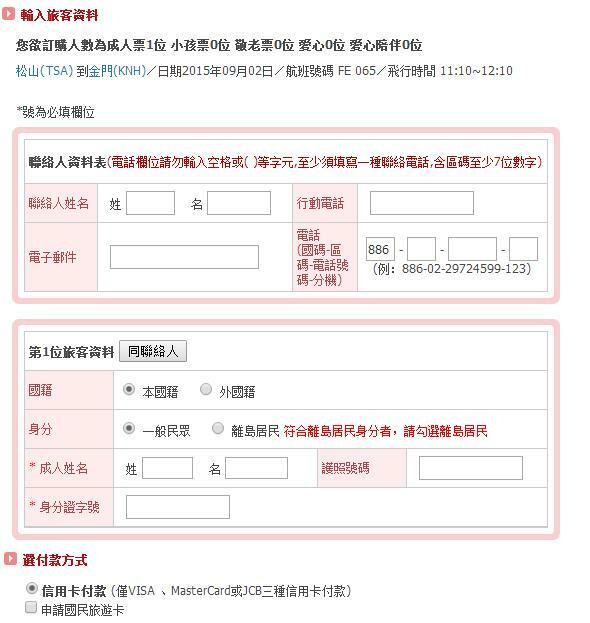 to make your payment by credit card. 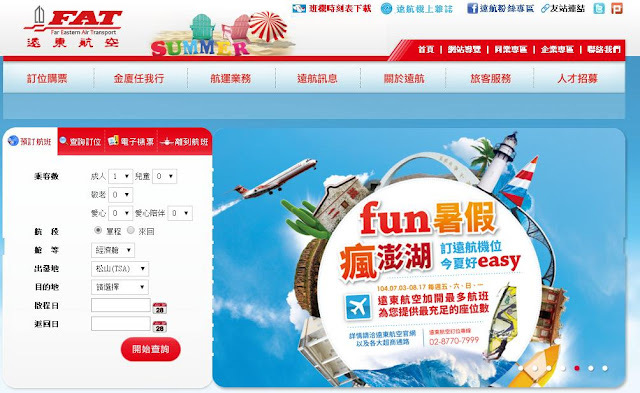 *WARNING - The website can suddenly return to the home page (due to website error) - that's the frustrating part of using this airline's website. Close the browser and try again. Once you are at the payment mode, check your flight details carefully before making your payment. You should receive your itinerary (check the photo below) via your email. If you have to make any changes, you can either call the local office, 電話：02-27121555 or head down to the airline counter at the departure airport. Once you are done, you are ready to go! This is my 5th domestic Taiwanese flight and its a joy to be able to do short rides on these routes without the need of carrying my luggage and even better - no immigration. Since the flight was at 0755, I got up quite early, around 5 and lazed around until 0545. Took the 2nd train out of Shandong Temple towards the direction of Taipei Nangang Exhibition Centre direction, stopped at Zhongxiao Fuxing Station and changed for the Wenhu line to Songshan Airport. I reached there around 0630, was slightly worried I missed the check-in cut off time, fortunately everything went well. Got my boarding pass from the friendly staff and my assigned seat of 34F. 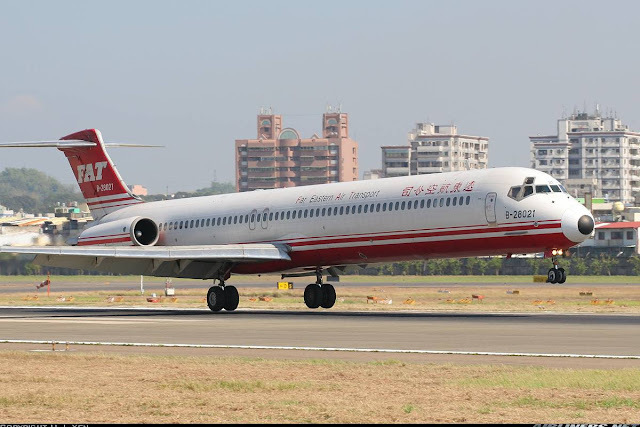 She warned me how noisy that row is and asked whether I prefer the front row, but I declined, I told her how much I love listening to the engine of this rare bird, the MD-82. It turned out later that the rows behind were empty and the crew on board was surprised to see me at that row, and they hinted to me a few times to move a few rows in front which I did during the flight. Songshan Airport is one building and it consists of both domestic and international flights. Located just beside the Songshan Airport MRT station, this airport is in the heart of Taipei, so travellers flying to nearby countries can check this airport out. 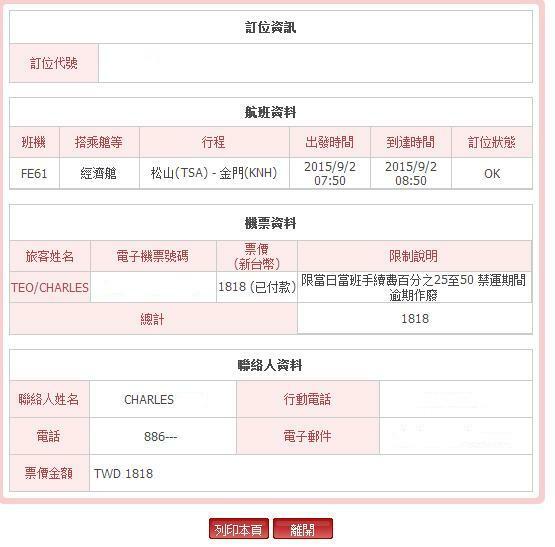 Of course, cities that are further away (3 hours and longer flights) are available only at Taoyuan Airport. This is the domestic terminal, turn to your right and walk for 5 minutes and you reach the international terminal. They are connected. Airport offers free Wifi and you can connect it almost every part of the building. You be pleased to know there is no need to log in, just click on the I agree option and you are online. Checking in for my domestic flight to Kinmen, this is the boarding pass, good for collection, its certainly better than the supermarket style receipt. One thing about the ink on this boarding pass, it fades after a while. For those who collect boarding pass, please take note. Checking in was done over here, another pleasant experience for me. Checking my flight, its schedule to depart on time. I wonder what does that 'Extra' mean for Uni Air's flight to Nangan. Extra flight for only that day perhaps? This is the land side, there are signs everywhere so you can't get lost. It was pretty quiet at that time, so getting to the air side was a very quick affair. This is the departure hall at the air side. These gates over here are for aircraft parked at the remote parking lot, which means passengers have to take the airport bus over. This was my first experience at this airport. You can charge your electronic devices at the table where the red shirt guy is sitting. Gate 13 was the assigned gate for my flight. There were other flights heading there too. The Airline Lounge for frequent flyers. Soon, the departure time came and an announcement was made to board the aircraft. After showing my boarding pass to the staff, I was directed to the bus outside the terminal. Once everyone was on board, the bus took us to the aircraft. There were 2 out there, the first one was B-28037 (MD-82) which I had not taken before and soon I saw my ride, B-28021 which I have flown before, so was a bit disappointing not to get the MD-83, but was looking forward to my 2nd ride on this aircraft. Not just that, I would be sitting at the same seat! First time boarding this aircraft this way, it was thrilling! You can see how low this aircraft is. The good and reliable Pratt and Whitney JT8D engines also powers the Boeing 737-100 and -200 series. Its time to board the aircraft - Its my first time boarding the MD-80 aircraft this way, my previous flights were by the aero-bridge at the terminal. This is one of my favourite angles of the MD-80. Nice to see this logo on the aircraft. Once on board, there were 6 crew members, that's quite a lot for this aircraft. The crew weren't particularly friendly when I walked down the aisle to my seat and a few of them looked stunned to see me sitting near the rear. I was the only one there and one of them asked whether I wanted to move in front and also asked to see my boarding pass. I wasn't happy at this point. Seeing them eager for me to move, I suggested to do so but another crew came and told me to change my seat during the flight. That was a good thing though. I will exclude this incident from my overview rating. Since this is a short flight and I had some freedom to roam around, I won't complain. Once again on this airline, no electronic devices were allowed during take off and landing. I was surprised the Captain made announcements in both English and Chinese updating us on our flight, I suppose English was meant for me as I was the only foreigner on board. The windows at the rear were closed to keep the cabin cool and they were opened once the aircraft was ready for push back. The 2-3 seating configuration of the MD-80. The 2-seater has better legroom space. The first row - bulkhead seat offers better legroom space than the others. Most passengers chose the rows in the front. I recommend the 2-seater. it is up till row 30. If you want to sit beside the engine, you have to sit at row 34F which is in my opinion the best window view for engine and wing shot. Behind row 30 is the crew's work space and seat, I guess they are used to the noise by now. The rear of the aircraft, can you see the exit door? You can exit the aircraft via the exit door with the staircase attached to the aircraft. Its not in used for FAT's flights though. The view from my seat, as you can see I was the only passenger sitting at this section. At this point, all of the crew were in front and that's how I got these photos. This photo was taken during the flight. I shifted to row 30 and not long after, the crew had a good conversation among themselves. The good thing is I got to take as many shots as I want, more freedom than my previous flights on this airline's aircraft. Happily on board the McDonnell Douglas MD-82 aircraft! Can you see the miserable seat pitch? I was actually glad to move on. The seat pitch on the 2-seater is better. Can you see the difference? It was less than half full - excellent for me! This was my seat, row 30A. I will be flying on Uni Air's ATR-72-600 in November 2015. More photos of the seats! The legroom space is comfortable. Some of you must be wondering, these aircraft are 25 years old and are they safe to fly? Yes, as long as they are maintained well, they are safe to fly. This airline has a good safety record, so not to worry. Do you know there are still some post-world war aircraft still flying? So don't worry, fly on this aircraft with confidence and besides it won't be long before this aircraft gets replaced. My recommendation: Get the front rows, 2-seater sets for more comfort and quieter cabin for the non-aviation travellers. There is no IFE (In-flight Entertainment System) on board so you have to settle for your own. Electronic devices can only be used during in-flight. The last few times I flew on Taiwanese domestic flights, I was only offered a drink and this time I was offered not only a drink, also a custard cake which is quite delicious. A choice of water, Chinese tea or coffee, I chose tea. The aircraft pushed back with the left engine fired up first followed by the right. To me, it is music to my ears! Noisy it was, but to hear the JT8D roaring was absolutely thrilling. Once the engines were stablised and pre-flight checks were completed. We taxied to runway 10 and took off immediately. My favourite seat on the MD-80 series. This is my 2nd time on row 34F on this airline's MD-82 and also the same aircraft, B-28021. The small private planes are resting at the remote parking lots. This is the video of the take off! Enjoy the JT8D engine noise! It was loud during the take off phrase but after reaching a certain flight level, the throttle was pulled back and the noise became softer. The take off was very powerful as usual, as the light load and short flight certainly help. You are being pushed back to the seat while accelerating down the runway, and I love that feeling! The climb was slightly turbulence but we got into smooth air not very long after. It was a good day for flying as the rest of the flight was smooth. We flew over the coast of Eastern Taiwan and soon over the water towards Kinmen which is quite closed to Xiamen, China. We flew through some clouds but not much turbulence. Midway through the flight, I moved to seat 30A and there is the view I got. Flying over an oil refinery. Soon, we were over the water and it wasn't long after, descending commerced. Flying through some clouds, but once again it was smooth. At this point, I wish the flight could just go on. We were soon on approach to Kinmen. As it was a quiet period, we flew straight in for landing. There was a bit of cross wind during approach but we landed smoothly. After touching down, we taxied to the airport terminal within 5 minutes. The airport is quite small and is used for domestic flights only. The Uni Air and Mandarin Airlines aircraft were also from Songshan Airport. We parked beside Uni Air's ATR-72-600 aircraft. That concludes my flight from TSA-KHH (Taipei Songshan to Kinmen). I have a few hours to kill for my next flight to Kaohsiung, and this would be my first visit to that city, finally! Stay tuned for my next part. Thanks for the ride, B-28021! It's my 4th flight with this carrier, enjoying the MD-80 ride very much. While I didn't find the in-flight service fantastic, they were professional through out. It would be great if the airline's crew opened up to passengers even on short domestic flights. As for this airline, it has a colourful history and I would revealed more about that in my next part. As for the MD-80s, they are edging towards retirement, a well deserved one. They have been working hard for the airline, bringing in revenue but as they grow older, parts and maintenance become more expensive, not to mention the engines are not fuel efficient, losing out to Mandarin Airlines' ERJ190 in terms of efficiency. 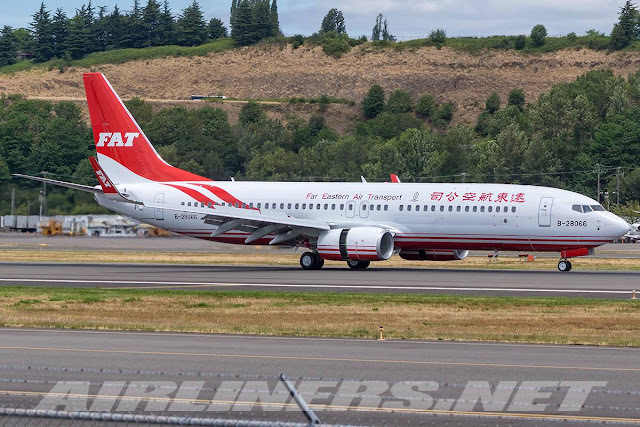 This airline will be taking delivery of new aircraft next year, probably leased Boeing 737-800s and I hope to be on the airline's new aircraft when the time comes. Thanks for reading this trip report!